I saw this grey owl sweater on needled quite a while ago and really loved it. So I bought the pattern, hoping that one day I will overcome my fear of circular needles and knitting cables and actually be able to make this. 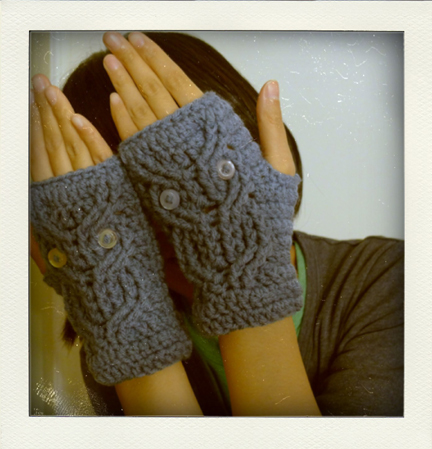 Meanwhile, I found this owl fingerless mitts pattern on Ravelry — and it’s a free download! (Though one needs to sign up to access it) They’re really quick to make and I got both mitts finished with eyes sewn and everything within 3 hours (I think looking for the perfect, iridescent buttons for eyes took the longest). I’m really rather happy with them :D Perhaps I’ll bring them along when I go out tomorrow! Very cute! Though the second picture reminds me of the creepy guy with eyes in his hands from Pan’s labyrinth… but if you haven’t seen it, I wouldn’t recommend it because its really creepy! These are so cute! 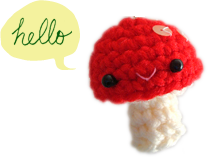 … I had to make some, too! BTW … I really enjoy your blog! thanks Amy! I’m quite addicted to Ravelry as well! 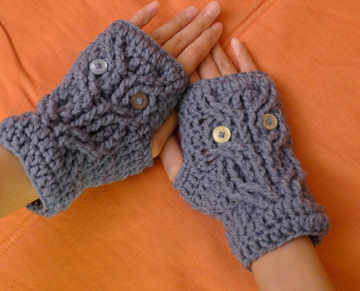 these are such great mitts! i’d only seen knit version up until now. i really want to try these out.